We are proud to present our new 3D back support system! A patent-pending innovation that is mouldable in all directions, ideal for asymmetry and kyphosis. 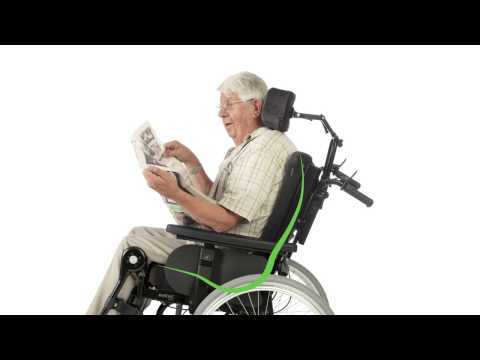 Back Support height: 45-60 cm (17¾"-23.5") Tilt angle: -3° to +20° Back support adjustable angulation: 0° – +30° Balance positions: Etac Prio with 20", 22", or 24" rear wheels has three altarnative balance positions for each seat height. Maximun user weight: 135 kg (21.5 lbs) Total Weight: Measured with arm supports, elevating leg supports, calf support, rear wheels and anti-tippers. Total width: M100 rear wheels +19 cm (7½") / Cross 5 rear wheels +21 cm (8¼") / 24" rear wheels, attendant brakes +24 cm (9½") / 16" hjul +19.5 cm (7¾") Seat height: 20", 22" and 24" rear wheels: 38–52.5 cm (15-20¾") 16" rear wheels: 40-45 cm (15¾-17¾") Transport weight: 22.9-23.8 kg (50.5-53 lbs) without arm supports, elevating leg supports, calf support and rear wheels.